Every time I eat out, I find myself eating at the same old places, eating the same old foods. However on one cold night, I found myself absolutely clueless on what to eat. While driving around in my car, I must have been arguing with myself for a good half hour on what I should have for dinner that night until I finally drove past a humble little restaurant called Nyala African Restaurant. Located along Brunswick St, Fitzroy, Nyala African Restaurant is the original place to come and eat authentic African Cuisine. Although the restaurant advertises itself as an 'African' restaurant, it mainly specialises in the cuisine of Ethiopia, which has often been described as the land of bread and honey. A typical Ethiopian dish you can order here is a wat (named 'Nyala Special' at the restaurant), a spicy stew made with beef, chicken lamb or goat. This famous national dish also has a vegetarian counterpart made from chickpeas and lentils, which is typically served during the religious fast. An essential ingredient to every wat is berbere, a combination of powdered chilli pepper and other herbs and spices. Like the French with their baguettes, a typical Ethiopian meal is always eaten with Injera, sour pancake-type bread made with teff. 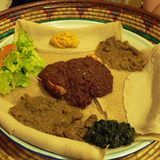 Apparently Injera has many more functions than acting just as bread for a meal; it can also be laid over the table like a tablecloth and one can pile spoonfuls of stew on top of the Injera, where the juices will be soaked in to be eaten. My favourite thing to do with Injera is to roll it up like an actual cigar and scoop the remaining sauces from a plate! Tahini – A delicious dip made from sesame paste, Yoghurt, lemon juice and a mix of spices. Deberja - cooked eggplant with green chilli and garlic, blended with natural yoghurt. Sambusa – Like the Indian Samosa, this is an Ethiopian savoury pastry filled with spicy mincemeat and served with spiced timatim sauce. Baboutie – A South African entree made from mincemeat, fruit chutney, sultanas, almonds, and other spices. Doro Tibs - Boneless pieces of chicken marinated in herbs and spices, then sauteed in mild chilli and finally drizzled with Nyala's Awazi sauce. Futari - A great tasting Tanzanian vegetarian dish where mixed seasonal vegetables are cooked with mild spices and topped with coconut milk. Tafach Mooz – Literally meaning 'sweet bananas', this delicious East African favourite is where you have layers of bananas lightly baked with brown sugar, cream cheese and cinnamon. What more can I say about this? The vibe of Nyala Restaurant is a great way to relax yourself for the weekend. While you wait anxiously for your food to arrive, take the opportunity to absorb your surroundings; your ears will enjoy the hypnotic rhythms of African music, while your eyes observe the many beautiful African artefacts and art works displayed against the walls and around this establishment. Nyala African Restaurant offers the best and widest range of African cuisine in Melbourne. So for a great way to begin your weekend, come along and experience some truly exotic cuisine at Nyala African Restaurant! Why? Have you tried African food before?